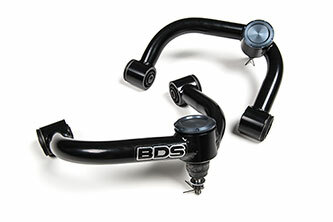 Coldwater, MI: BDS Suspension adds to its lineup of heavy duty upper control arms (UCA) with new kits available for the 2004-2018 Ford F150 trucks. These new UCAs are designed for improved strength, great looks, and more wheel travel on leveled and lifted for the Ford F150. The new performance control arms are built from high strength 1.5" OD x .120-wall tubing, gusseted for strength and durability. They use an indexed ball joint cup to correct the ball joint positioning for use with 2-3" leveling kits and most full IFS lift kits on the market. The frame mounting ends feature durometer-specific rubber bushings. At the other end they use an indexed ball joint cup with and premium Moog-brand ball joints for smooth, quiet operation and superior durability to arms that feature uniballs, poly bushings or heims. These control arms come finished in a durable semi-gloss black powder coat and include a billet aluminum machined BDS ball joint dust cap as well as proper brake line attachment points to ensure a factory-like fit. The arms integrate a mounting tab for the factory brake lines so there's no need to zip tie the lines like with other kits. The control arms come fully assembled for easy install right out of the box. Take your Ford F150 to the next level of ride quality and performance with suspension upgrades from BDS. Designed for use with 2-3" lifts and compatible with many full IFS lift kits. Can be used with BDS 2.5", 4" and 6" kits. These UCAs will bolt right into the factory mounts and allow for improved droop travel over the factory arms. Will this work with a Rough Country leveling kit? I have a 14 4×4 f150 with the BDS 2.5” level, will these UCA’s help with the control arm hitting the spring during suspension travel? Short answer is yes, these UCAs are compatible with the BDS 2.5″ Leveling Kit. On the topic of your stock control arms contacting the springs the factory suspension clearances are very tight and if too much positive caster angle is added its possible for them too contact the springs at full droop. The BDS UCAs are formed for more clearance and add 1.4 degrees of caster so you won’t have that issue. I got a 2008 f150 limited awd will these fit my truck??? Your ’08 F150 AWD uses the same suspension as the 4WD model so these UCAs will be a direct bolt on. I have a 2010 f150 4×4 with 3” level kit installed and my uca hit the springs when going over bigger bumps, will these hit as well or should they clear? Also Are the ball joints in these replaceable? Hey Colby, the short answer is yes, these UCAs will help with clearances so you shouldn’t have that issue. Ultimately the issue you’re having is due to where the caster is set causing there to not be enough clearance for your stock control arms to clear the springs when installing a leveling kit. The BDS UCAs are formed for more clearance and add 1.4 degrees of caster so you shouldn’t have that issue. The ball joints are replaceable and can be ordered from us or picked up from your local BDS distributor. Hey Tony, our UCAs are compatible with stock and aftermarket wheels and would work just fine with your setup. What is the widest tire on a stock 17 in wheel that can be run with these. Hey Keith, we don’t tested every potential tire/wheel combination to know what the maximum tire size that will clear the UCAs with stock 17s. To that point an all terrain tire size that barely clears would have an likely rub in that size of mud terrain due to the aggressiveness of the sidewall lugs. Its difficult to give a definitive answer. Installing fox 2.5 dsc coilovers with the bds uca on a 05 f150, eventually will get larger tires and wheels but will the stock 17 wheels and tires fit till then? I have a 2017 SC F150 STX 4×4 w/ Bilstein 6112 kit set at 2 inch level up front and 5100 in back. I have stock tires 275/55R/20 with stock Rims 20×8.5 +30mm off set. my plan eventially want to go to 285/55R/20 with 20×9 inch rims and what I was told with +18mm offset. Is that correct using +18mm offset on those rims? Cause I don’t want to much of the tires sticking out. Now will your BDS UCA’s will work fine with current set up and future setup? What kind of longevity can I expect with the BDS UCA’s? It indicates you can grease up the ball joint. But, what about the UCA’s bushing at the Frame connections. How would they be lubed, if any? one last important thing, are the frame bushings and ball joints replaceable. As I tend to keep my trucks for a long time. My usage is daily driver and occasional serious off roading. Not so much rock climbing. But, want some articulation and traction to get me out of situations. So I am so tossed between your UCA and Icon Delta Joint. Convince me as to why I should lean towards your UCA? What are the Pro/Cons. I am looking forward to your response and Thank You So Much. A lot of questions packed into your comment so I’ll try to answer them all. Wheel/Tire Compatibility: Our UCAs are compatible with both stock and aftermarket wheels, you’ll gain about a .25″ of clearance on the backside of the wheel going from those stock 20s (5.93″ BS) to aftermarket 20s (5.71″ BS) and overall will be sticking out about an additional 1-1.25″ from where you are now with the width of the tire/wheel. Our UCAs are compatible with both stock and aftermarekt wheel setups so in either case these will work great for you. Longevity/Maintenance: Our UCAs are build strong our of DOM tubing, fully welded and finished in a durable powdercoat finished. The frame mount ends use OE style Clevite rubber bushings for maintenance free operation and long lifespan just as you’d expect from the factory arms. On the other end we use a high quality Moog ball joint that can be easily serviced by removing the ball joint cap and provide a long service life. The ball joint cup is indexed from the position of the stock UCA to provide better positioning of the ball joint when used with a level kit allowing for additional droop travel. If you ever need to replace a ball joint they can be purchased directly from us or are readily available through your local auto store. IVD Comparison – we make a point to not bash other brands, but rather talk about our products features. Between the high strength construction right here in the USA, the no fine print warranty protecting these arms, the various wheel/tire compatibility and everything mentioned above in my comments and in the product announcement these arms a great value and quality upgrade for your F150.